March with us in solidarity for an end to deaths in custody. There have been over 3000 deaths in state custody since 1969. There has not been a single successful homicide prosecution, despite evidence of unreasonable force and several unlawful killing inquest verdicts. 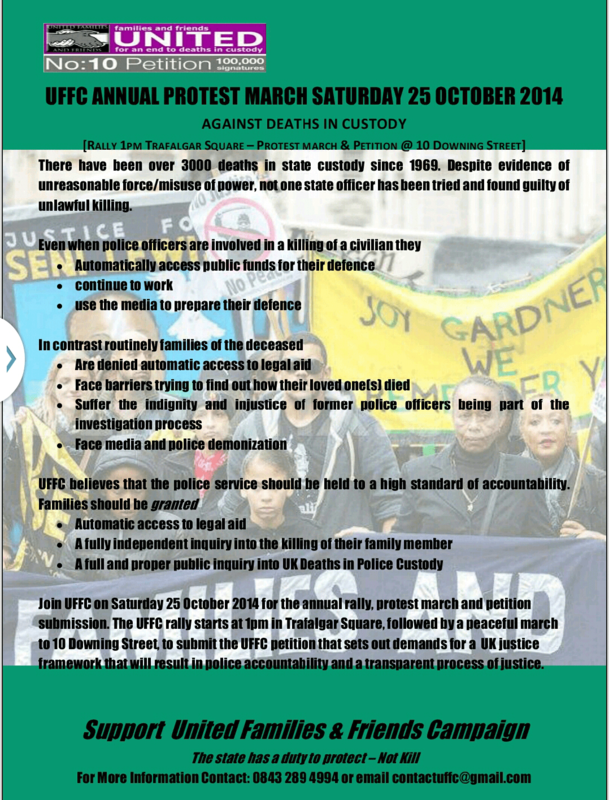 Join United Families and Friends Campaign on Saturday 25 October 2014 for their annual rally, protest march and petition submission to 10 Downing Street. Assemble for the rally at 12pm in Trafalgar Square. Please wear black. London Campaign Against Police & State Violence will be there with banners. Marcia Rigg of the Sean Rigg Justice Campaign will now be speaking at our conference. This means we will no longer be screening Burn but instead a section of Who Polices the Police which is about her family’s story. People who want to see Burn can come on Friday 17th October to our film screening of Burn with United Families and Friends Campaign at Birkbeck University. More details on Facebook. On Wednesday 10 September 9am at Westminster Magistrates Court, “E7”, the officer charged with the murder of Azelle Rodney will be appearing in court. The family have asked for support in having a peaceful and dignified presence outside the court. The family have asked please don’t use the words “murderer”, “killer” or any other inflammatory language on any placards or banners as this could harm the prosecution’s case. Please join this Facebook event, and share. D, a black man assaulted by police in Brixton in June this year, appeared in court for a case management hearing on Tuesday 2 September. His supporters and members of LCAPSV maintained a presence in the public gallery and outside the court throughout the proceedings. D’s case has been scheduled for 5 January, and we will be there to stand in solidarity with him as he faces charges of obstruction of a police officer.